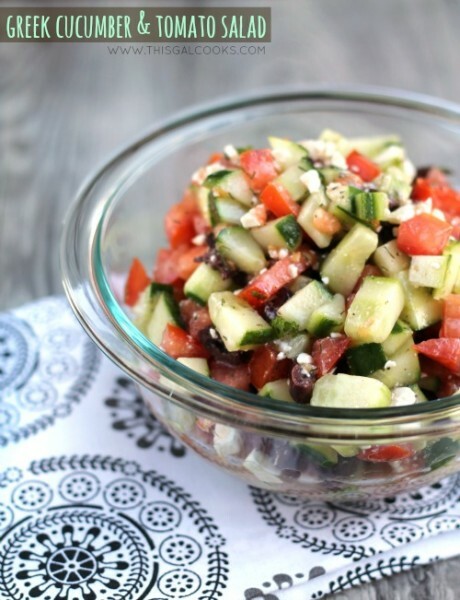 This Greek Cucumber & Tomato Salad recipe is perfect for a hot Summer day. 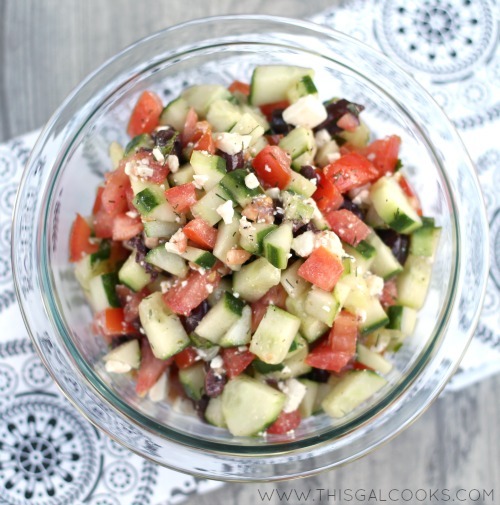 This salad is made with a homemade sauce and topped with kalamata olives and feta. It’s hot in Florida. Since we haven’t hit the Summer months yet, there are still a few nice days but pretty soon, the lows will be in the upper 70’s and the highs will be in the mid 90’s. Add in the humidity factor and you’re looking at feels like temps above 100 degrees. And that’s every day from the beginning of June until the end of September. Having grown up in Central Florida, I figured that all of Florida was completely unbearable during the Summer months. And it pretty much is but now that I live on the East Coast of Florida pretty close to the coast, I’ve found that coastal living is a little more tolerable. The almost constant breeze helps alleviate some of the heat. What does all of this talk of heat have to do with food? Well, we all like to make as little use of the oven as we can during the summer months. 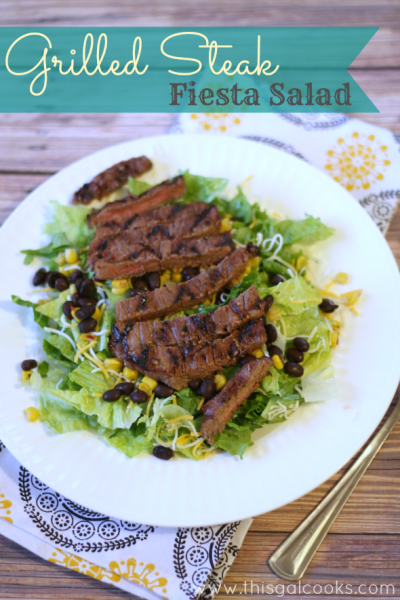 And this salad is perfect since it’s a chilled, meat free salad. No baking involved at all! Now I have a slight love affair with all things Greek cuisine so I created this recipe with inspiration from Greek style ingredients. 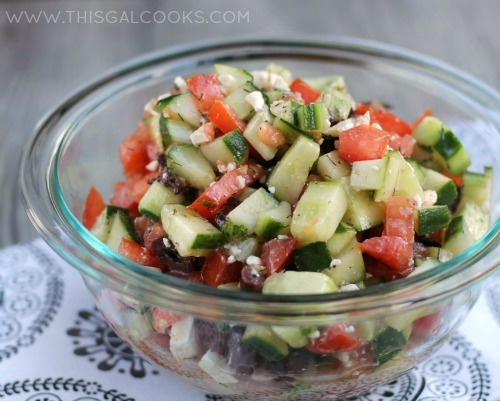 Cucumbers, feta, dill, mint, kalamata olives, tomatoes; you can find all of these ingredients in Greek dishes. Not only is this salad packed with nutrients from the fresh tomatoes and cucumbers, it’s a low carb. I hope you enjoy this recipe. In a mixing bowl, combine the cucumbers, tomatoes and olives. In another mixing bowl, whisk together the olive oil, vinegar, lemon juice, dill and mint. Pour over the veggies. Start out with ½ tsp of the Greek seasoning, mix together and gradually add more until your taste preference is reached. If the mixture ends up being to watery, remove some of the liquid. The tomatoes and cucumbers will secrete water causing the mixture to become watery. What meals do you like to prepare on a hot Summer day? I have a little love affair with all things Greek too! This is the perfect side for any bbq or picnic! Pinning this for sure Julie! Where can I find the nutritional info for this totally delicious salad?! I have a soft spot for Greek food as well! The salad sure does look refreshing! Living in Texas, I can relate to the heat, the humidity, all of it. I don’t bother blow drying or applying makeover during the summer months anymore. I’m totally making this! LOVE Greek salad. Pinned! Definitely have to give this a try! Looks delish! Good luck in that humidity. We are down to our last month here in St. Louis before we move back to the dry, Utah heat! Humidity is rough!! This look so fresh and reminds me of when I went to Greece… their salads have no lettuce just fresh veggies and feta like this… pinning!! Love your recipe, Julie! 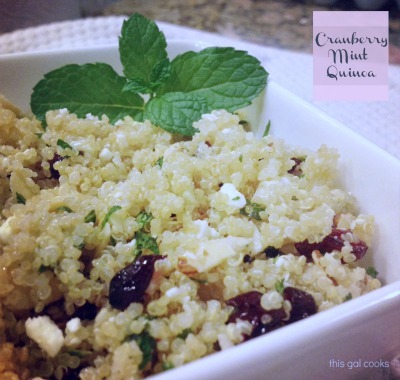 Never though of adding Mint to my Greek salads – will have to try it :-) Thank you for sharing at our ALL MY BLOGGY FRIENDS party ! We are looking for some tasty and “un-ordinary” side dishes for a 50th wedding anniversary party that we are helping to put together for my mother-in-law’s sister and brother-in-law. We live in the midpoint of the country from everyone, so the gathering is going to be here…..which means that since everyone else will be arriving at the last minute, our family is in charge of putting food together. Praise the Lord my husband enjoys cooking for large groups. These salads look magnificent, especially the Greek Cucumber and Tomato Salad – I’ll be lobbying hard for that one to be included on the menu! Thanks for some new ideas. 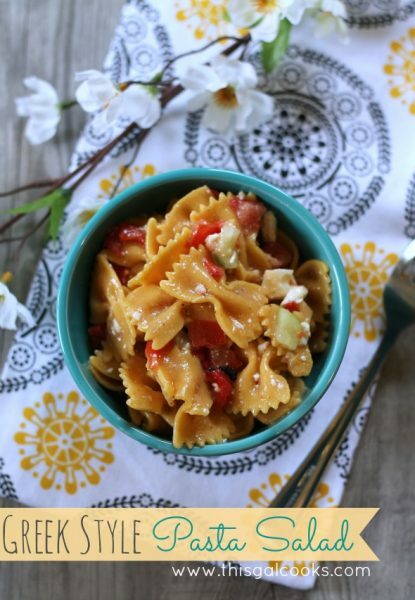 It’s so easy to make and it’s packed full of flavor! Perfect for a gathering, especially a gathering during the Summer! Oh I would love to be in California! I hear the weather is so nice there. Plus, you get the best of both worlds: the beach and the mountains! Well ……. you also get Gov. Moonbeam, the worst economy and taxes in the nation, and just WAIT until Obamacare kicks in. God help you all out there. I live on a small island off the coast of Maine. We like the Tea Party and freedom. Someday Kalifornians will get smart ………. My brother lives in Eureka. I think he’s planning on leaving soon. I grew up in Japan where summer is humid and hot. I live in California for about 18 years now and I’m so used to this dry weather that I *almost* forgot how humid summer is like. I remember I eat cold noodles and eat cucumber salad a lot. This is definitely a nice salad in summer time! Thank you, Nami! I’ve heard the weather in California is near perfect! Plus, you’re close to the mountains and the beach. Who could resist that?! Thanks for stopping by. Great looking salad love the touch of mint. Don’t you just love the heat? NOT. THank goodness for air conditioning! I can’t wait to try your salad using the goodies from my garden ♥♥ pinned it! Ugh, I HATE the heat! I tell ya, it seems that there is a wall that is lifted once it hits June 1st. The wall is lifted and all of the heat arrives. It’s always beautiful through May but once June 1st hits, it’s unbearable!